I'd like to think that just about everyone reading this has at least heard of The Avengers, and I'm talking about the TV series not that abomination of a feature film. But even if you know it and have even seen a few episodes, there's a good chance they'll have starred Diana Rigg or Linda Thorson, or even Joanna Lumley if you count the later New Avengers revival. It was in the Emma Peel years that the series moved to 35mm and then to colour and gained what is still one of the greatest of all TV theme tunes. But it didn't start that way, no sir. Back then, the show was a different beast. Back in series 1, things were a little different. First up there's the title sequence, which is downright primitive by modern standards and there's no sign of Laurie Johnson's iconic theme tune. The one here is by Johnny Dankworth, and decent enough though it is, I'm fairly sure it's only lodged in my head at all because I've just watched the twenty-nine episodes it adorns in a row. And if you come to the first series having only experienced the shot-on-film visual polish of the later episodes then you're likely to be in for a surprise or two. In the early sixties TV drama was largely shot live in the studio in black-and-white and recorded to video tape in a single session. Video tape technology was in its infancy then and editing it in the manner of film was a near-impossible task, so actors and camera crews were rehearsed and the show was performed like a play for the recording, complete with rapid costume changes and multiple scene set-ups, with the added complication of having cameras to direct and move to keep them out of the way of the actors. Exteriors that couldn't be faked in the studio were shot on film and inserted live into the timeline when their moment came. If a serious mistake was made forty minutes into the show then the whole thing had to be started again from scratch. For any young aspiring filmmaker with a DV camera and a copy of Final Cut Pro, the concept must seem unimaginable, but this was standard practice at the time and the programme makers had it down to a fine art. If mere mention of The Avengers conjures up the image of a bowler-hatted John Steed and an attractive but deadly black-dressed woman – and why shouldn't it? – then know that in the first series Steed not only had no female sidekick, he was not even the lead character and didn't appear in some episodes at all. No, the central character here was Dr. David Keel, played by Ian Hendry in a development of his role as Dr. Geoffrey Brent in the 1960 series Police Surgeon. Keel was a general practitioner who gets to live out the title role when his fiancée is murdered and he goes in search of those responsible, aided by a shady but well dressed figure named – you've guessed it – John Steed. This was a crime-fighting series in which the lead wasn't a professional crime-fighter at all but an interested amateur, one aided and often abetted by a man whose employers are never formally identified and are known only by their double-barrelled numbers (One-Ten, One-Seven, etc.). 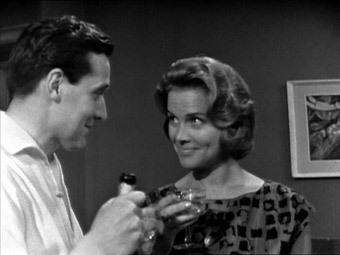 When the show's popularity led to the commissioning of a second series, the loss of Ian Hendry to feature film work prompted a character rethink, and series 2 saw Steed promoted to the lead and three different sidekicks tried out for size, the most radical and popular of which was Cathy Gale, deliciously played by Honor Blackman. A woman like no other on TV before her, she was as smart and tough as any man that stood in her way, a widowed anthropologist who dressed in black leather and was a dab hand at judo – point a gun at Mrs. Gale and you'll likely end up face down on the floor with your arm twisted halfway up your back. Watching the first two series consecutively over the course of five days (and believe me, to achieve this feat required running them during breakfast, lunch breaks and even on a laptop when taking a bath) made me acutely aware of the consistency of certain elements: Steed's almost unwaveringly cheerful disposition; the number of shows that start with a murder or the declared intention to kill; the frequency of conflict that turns into gunplay; and how readily Steed and Gale give their real names when working undercover – presumably they've locked up everyone who might reveal to others who they really are. But it also highlighted just how consistently well put together these shows were, how tightly scripted, how spontaneously performed (something several of those involved felt was lost in the transition to film), and how damned well directed they were – honestly, there are shots here that would take feature film crew hours to prepare and execute and the sort of tight editing you tend to think of as exclusive to film in these pre-Avid days. And yet this was all done live, and no sooner had a cameraman executed one of the director's more ambitious shots than he'd be hauling a camera the size of a small hippo across the studio floor to frame up for his next close-up or locked-on-actor tracking shot. Inevitably this resulted in a few glitches that just had to be lived with – more than once you'll see the picture judder violently as the camera collides with something, a mic boom or camera will occasionally pop into view, a premature cut will catch a cameraman in the process of lining up a shot or changing lenses (the TV cameras of the time had three lenses of differing focal lengths mounted on a rotating plate that could be rapidly switched to achieve the required image), and in the days when caption cards were filmed on a rostrum camera, it's no big surprise when a fly lands on one of the ad bumpers. The video tapes themselves have picked up the odd bit of damage and their transfer to 16mm film for archiving has added the odd hair to the side or corner of some frames. The switch to and from the film inserts is also not always as smooth as the programme makers would doubtless have preferred. But it's essential to see this in context of the year of the series' production and the conditions under which it was made, and none of this detracts from the fact that these early Avengers episodes were and still are compelling television, their consistently smart scripts attracting a regular stream of top flight acting talent and creative, ambitious and TV-savvy directors. The tragedy is that so much of series 1 has been lost to history, with only two full episodes and the first third of the first show surviving. Series 2, thankfully, is completely intact and in generally good shape, the above listed provisos aside. The only peculiarity here, which may well be explained in the release version of this set (I'm working from a series of review discs with no accompanying booklets), is the order in which the episodes have been placed, which initially differs markedly from their original screening order, though does settle down to the original sequencing by the end. As I said, there may be a reason for this of which I'm at present unaware, but to clarify this in the guide below I've given the original episode screening number in brackets after each title, which have been covered in the order they appear on the discs. The very first episode introduces our lead character and his fiancée, then provides justification for the series title when the latter is killed by a drug-dealing villain who's convinced she will recognise one of his goons, who delivered a consignment of heroin to Keel's surgery in error. The characters and situation are compellingly set up through some smartly written and briskly performed dialogue and a confident and expressive use of the 4:3 frame, especially given the fact that this was a live recording. Unfortunately only the first 20 minutes survive, so be prepared to scream "noooo!" at the TV when the episode comes to a frustratingly premature end. A textual explanation of how the story developed and concluded is thoughtfully provided. Dr. Keel rescues a girl who attempts suicide by jumping into the Thames, and on discovering that she's a trapeze artist he tracks down and investigates the circus at which she was previously employed. There's clearly something shady going on behind the scenes, but what? Despite Macnee's shared front title credit, Steed doesn't appear in this story, allowing us to fully focus on the considerable merits of Ian Hendry as a leading man. The setting itself makes for a visually lively episode and scriptwriter Dennis Spooner (who cut his teeth with Gerry Anderson and went on to work on The Champions and The New Avengers) and director Don Leaver keep things moving at a sprightly pace. Hendry briefly gets to play the action man, and for a just one scene his nurse Carol (Ingrid Hafner) becomes a true Avengers girl. At last we get to meet first season Steed, and in the course of this splendidly written and smartly performed drama are given a real taste of just what a loss to television history the missing episodes represent. Here Steed pops back into Keel's life to introduce him to the work of a pair of 'massage specialists', two hoods who have been sent by a Sidney Greenstreet sized criminal to beat up a man named Jeremy de Willoughby, acting on orders from hard-nosed business mogul Sir Thomas Weller (Stratford Johns). Steed and Keel interrupt the beating and haul one of the goons back to Keel's surgery to treat wounds they were responsible for inflicting. Here we get to see a side of Steed that seems unique to the early episodes, when he's left alone with the man and a cut-throat razor and in a matter of minutes has him screaming in terror, something that alarms Keel but fails to make even a small dent in Steed's cheery demeanour. The Optimum ordering of series 2 kicks off with a personnel switch. Production was delayed by an actors' strike, during which Ian Hendry landed a film contract that left him unavailable to continue as Dr. David Keel. So instead we have Dr. Martin King, played with considerably less charisma by Jon Rollason, who teams up with Steed aboard a passenger liner to Montreal to recover a microfilm being carried by celebrated actress Carla Berotti (Patricia English). There's murder and intrigue afoot, although less of the latter than in the first season's The Frighteners, but having Steed disguised as a ship steward allows him to flit between smiling gentleman and crime-busting agent in a manner that foreshadows the character we later came to know and love. It's also the first time in the surviving episodes we get to see him with both his signature bowler hat and brolly. A Montreal to Ireland flight being talked down in fog crash-lands, killing most of those on board. Steed is called in to investigate and enlists the help of Dr. King, and they soon discover that the crash was neither an accident nor the first of its kind. A lively if unexceptional mystery thriller that sees Steed and King adopt the roles of Holmes and Watson in a two-pronged investigation with a good share of character high points (Steed flew Lancaster bombers in the war, apparently) and the usual briskly performed dialogue exchanges. A visiting French minister whose death would have serious consequences for world stability is almost assassinated while under Steed's protection. An informer is suspected, but as Steed investigates – with Dr. King's reluctant assistance – he himself becomes a prime suspect. A first class and densely plotted espionage thriller that gives us our first glimpse of the people Steed works for and occasionally with. 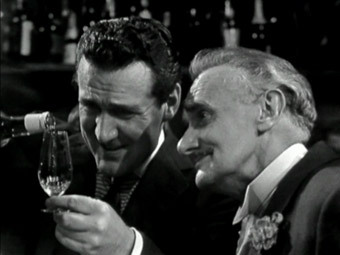 The most intriguing of these is the well-spoken and high-ranking One-Twelve (Arthur Hewlett), who calmly warns the agent charged with following regarding our boy, "Be careful, Fraser – Steed's very good," and smilingly concludes a conversation with Steed over the nature of their job with the question, "Who guards the guards?" Who indeed? The Emma Peel title sequence to come is prefigured when minister Roland pops a carnation in Steed's buttonhole. 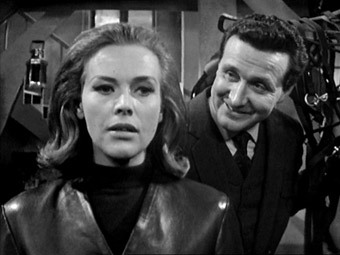 A terrific episode that finally unites Steed with the first Avengers girl, Cathy Gale, deliciously played by Honor Blackman. Of course when I say finally I'm referring to the order the episodes have been arranged in this set – it was episode 13 on the original transmission and audiences then would have been introduced to Gale eleven episodes earlier, which is actually a shame, as this would have made for a marvellous introduction. 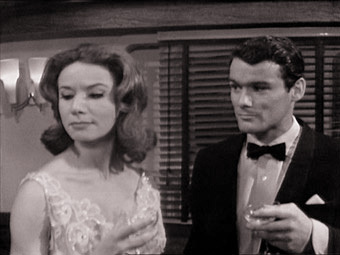 Setting the scene for episodes and Steed partners to come, Gale is as smart and dangerous as she is attractive and the two are paired when a courier carrying seemingly unimportant papers is murdered and Steve is seconded to take his place and bring the killers and their purpose into the open. 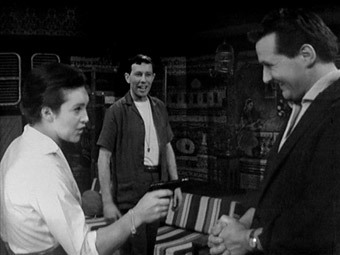 A globe-trotting episode with more film inserts than usual (which still stand out a mile from the video footage they were designed to match), its highlights include Gale calmly foiling an attempt to nab Steed, a sequence where she most convincingly masquerades as a Spanish-speaking maid, Steed's encounters with a fussily disapproving embassy employee ("You just can't leave dead bodies lying about the place you know") and a half-undressed Gale leaning towards the camera in what plays almost like a challenge to TV chiefs to cut the shot. In what became a refreshing staple of this series, the bad guys are as smart as their foes, and Steed and Gale are shown to be every bit as ruthless as Ian Fleming's Bond when they disarm an enemy by grabbing his young daughter and putting a gun to her head. A passenger on a commercial flight receives a communication and becomes convinced he is going to die. Turns out he's right, but not until the plane lands and just before he has a chance to tell Steed the location of the package he was due deliver. Steed enlists the help of Cathy Gale to help find out what's happened to the missing item. Just as well really, as after breaking into the airport security office and beating up a rival, he becomes a wanted man. It takes a little while to confirm that the airport around which the action takes place is in France, since the airport staff all talk like Londoners, a bypass-the-accent trick later used to such splendid effect in the likes of I Claudius and Private Schulz. Another tightly constructed and enjoyable episode with the usual sprinkling of character highlights, including a lovely bit of banter between Steed and Gale in a French lingerie shop, a scene in which Steed orders a box of cakes from a cook whose premises he is in the process of searching, and the revelation that Gale is working to feed starving children in Africa (something Steed all but ignores) and carries a pistol in her garter belt. Guest starring as a suave and womanising enemy agent is none other than a young Geoffrey Palmer. The episode's only real weakness lies in how willingly everyone from café workers to airport security officers are prepared to hand out important information. The series opener, or at least the first one to be transmitted, finds Steed and Cathy Gale already well at ease in each other's company and attempting to track down the elusive and technically creative hit man of the title by having Gale take out a contract on Steed's life. Not the most cautious of plans, you might think, but Steed is as cheerfully upbeat about it as ever, at least until Mr. Bear effects an ingenious assault that prompts Steed to an immediate and instinctive reaction that prefigures Bond's urgent response to being poisoned in Casino Royale. Once again the villain is shown to be as smart as the heroes and Gale gets to practice her judo skills on Steed, who never passes an opportunity to womanise, even with his resistant partner. The scientific element brought to the show by scriptwriter Martin Woodhouse is very evident here in the method used for the opening murder and the attack on Steed, and the dialogue and delivery are as lively as ever, my favourite line being when Steed reappears after being presumed murdered and Gale snaps at him, "Why aren't you dead?" Balkan president Yacob Borb is in London to secure an aid deal and Steed is charged with overseeing his security, a service Borb himself sees no need for, preferring as he does the protection of his muscle-bound personal guards. When Borb's attractive young 'secretary' is murdered, Steed uses false promises of a Balkan singing tour to persuade nightclub singer Venus Smith to take her place, giving him a contact inside of the Balkan embassy. But when Borb's guards are both murdered, the threat to the president becomes all the more urgent. Steed's third sidekick of season 2 may not be as deadly or as smart as Cathy Gale, but she she's tough enough to give President Borb an earful when he fails to show up for an arranged date. Mind you, Borb's idea of a good night out is a wrestling match, at which one of his guards is fought to the death by a masked wrestler known as The Decapod, the same fellow who offed Borb's bit on the side at the story's start. A fun episode that shines in its well-developed and resolved plot, in Philip Madoc's deliciously distrustful cool as Ambassador Stepan, and in the realisation that Steed can be a bit of an exploiter when the mood takes him. Cathy Gale buys a twenty percent share of a British arms manufacturer that recently lost its chairman to suicide, and at a shareholder's meeting her pertinent questioning sees her elected to the board of directors. She immediately sets about examining the books and assets of company she has bought into, but when a second director is found dead behind a target on which she is trying out the company's latest assault rifle, she falls under police suspicion for his murder. Of course the whole thing's been set up by Steed, who effectively takes a back seat here to allow Gale to take the lead, which Blackman handles with aplomb. Most enjoyable support is provided by Ronald Radd as ruthless venture capitalist Henry Cade, a sort of rotund British Gordon Gekko, if you can imagine it. An intriguing first few scenes where we're left to work out exactly what's going on see Steed scoot off to Cannes to infiltrate a gang of international assassins, which just happen to be operating out of a jazz club where Venus Smith has a singing contract. Once again she becomes unwittingly involved in Steed's plans, while Steed himself faces a tough test when gang leader Bug Siegal (Edwin Richfield) orders him to carry out a hit on top French actress Nicole Cauvin (Edina Ronay). A slightly lesser episode that pauses three times for musical numbers (which the video imagery make look like extracts from a TV variety show), but is well worth seeing, not least for the low-budget TV studio version of a sun-soaked Cannes beach. News that a rare stamp is being offered on the open market leads to murder. Steed and Gale investigate and follow a trail that leads to a secret fascist organisation with ambitions for parliamentary rule. An intriguing story with still relevant political undertones – on the commentary track, feed man Jaz Wiseman draws parallels with the recent rise in popularity of the BNP – and a standout scene in which Steed impersonates the patient of a dentist who is one of the organisation's key members and nearly suffers a Marathon Man-esque fate when he is rumbled. A dog is dead, a man involved in a car accident has £50,000 of diamonds in his stomach – is there a connection? An almost Holmesian storyline is given an Avengers makeover, as Steed investigates the source of the gems by blackmailing the company that supplied them. His attempts to speak to company chief Litov are stonewalled by the businesslike Getz (Frederick Jaeger), the sort of money-minded executive who's not going to let the threat of blackmail interrupt his business dealings or prompt him to bat an eyelid. Character-wise, this one's a treat, with the splendid John Laurie (the doom-predicting Frasier from Dad's Army) on delightful form as Litov's doctor Sir James Mann, though he's almost outdone by Leslie French, who brings a sizeable dash of Eric Blore to the role of eager-to-please butler Gregory, his exchanges with Steed and his dreams of how to spend riches being among my favourite scenes of the series so far. A woman receiving beauty treatment in her own home is suddenly suffocated by her beautician. A short while later Steed sets himself up in partnership with the diamond merchant husband of the unfortunate victim in order to investigate a recent surge in diamond smuggling, something that involves Gale posing as his wife for a couple of weeks. As usual, Steed is on the money and he and Gale are soon close to – and under threat from – an organisation that ensures the cooperation of its members by threatening their families. Steed once again shows he's ready to put his partner at risk to achieve his ends and then make light of the possible consequences, though the episode also has one of the most engagingly light-hearted moments between the two, when Steed carries Gale on his shoulders and she rolls her eyes in amusement – there's almost a sense that this was improvised by the pair and all the more fun for it. The dialogue has its moments, as when a disgruntled employee is warned that "No-one can be protected every minute of the day – it only takes a few seconds to kill a man," while the darker side of corporate capitalism is touched on by the leader of the diamond smugglers, who when a colleague questions the idea that the government would strike a deal with murderers replies coldly, "Why not? We shouldn't be the first monopoly to establish ourselves over a few dead bodies. There's a price for everything." Ain't that the truth. A naval officer named Crane is charged with passing on secret information to the enemy, which has been used to jam the first test run of a new missile defence system. Steed arrives at the base as a naval psychiatrist but Gale has already landed a job in the test lab itself, which makes you wonder just who is in charge of security here and why the enemy have to go to so much trouble to get the information they need. Steed grills Crane and becomes convinced of his innocence, but if he wasn't responsible, who was? Cathy is uncharacteristically slow off the mark here, failing to spot the obvious when she sees local artist Rankin scuttle across the pub to record the position of the darts on the board in a little note book, while Sub-Lieutenant Graham (William Gaunt, later to star in The Champions) introduces himself as Crane's closest friend and defends him so enthusiastically that you start to suspect he's actually covering up for something. The best is saved for last, when Steed's self-confidence and merciless cool sees him trap a saboteur in a room in which his only hope of survival is to diffuse his own bomb, something he clearly has no intention of doing. When one of the scientists working on an experimental supercomputer is found dead in its central processing room, Cathy Gale turns up to investigate wearing her anthropological hat and looking to use the machine to help translate dead languages. She's quickly latched onto by the project's cocksure whiz kid Dr. Jimmy Kearns (familiar face Anthony Booth), a man with all the people skills of a Northern England version of Gregory House. When project boss Dr. Clemens is also found dead, suspicion falls on Kearns, who promptly disappears, and it soon emerges that Gale and Steed aren't the only ones looking for him. A science-based episode whose opening camera move has a feature film complexity (this was still live TV, remember) and whose best character moments are a delight, with Gale once again credited with the sort of smarts that leave her television successors looking dumb by comparison, immediately sussing a subtle attempt to pass her a drugged drink and quickly spotting and disabling a hidden intruder in her flat. When she does get caught out, Steed cheerily pops in to turn the tables, although there is a slightly dues ex machina whiff to his too-timely appearances here. He does play the supporting role in this one, though – this is very much a Cathy Gale episode. When two safecrackers are shot and left for dead, a connection is made to twelve other London-based crimes that appear to be the work of the same international criminal group. Information provided by a survivor of the shooting leads Steed and Gale to German assassin Hilda Stern, whose shoddy false passport has seen her grabbed at the airport and banged up at her majesty's pleasure. Gale goes undercover and shares her cell, and when an escape plan is launched she takes Stern's place and infiltrates the gang. 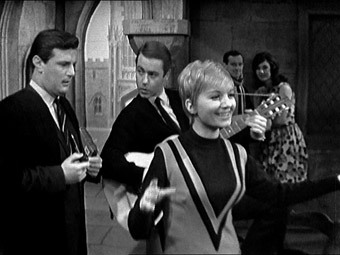 Some familiar situations here, including the job given to Gale as Stern that she morally cannot do and the eventual escape of the real Stern to place our Cathy in mortal danger, but all are well handled and Steed is on hand to flash a smile at every turn of events and pop up in the nick of time, a rare instance of Gale having to be rescued by her male partner. When scientist Peter Neville falls into a mysterious coma, a connection is made to the modern day sorcery and the similarty of an earlier case. Good thing, then, that Neville's friend John Steed is on hand to investigate and that his regular partner Cathy Gale is something of an authority on the occult. Neville, it turns out, is under the control of Dr. Cosmo Gallion, an acknowledged expert in these matters and the warlock of a secret coven, in which role he has a spell on Neville for enemy agent Markel (a convincingly intimidating John Hollis, even if he looks a bit like Ade Edmondson in Bottom when he dons his glasses). Although it acts as a pointer to the later fantasy-based episodes of the Emma Peel years, Warlock sits a little uncomfortably within the crime thriller format of this series, particularly in the visualisation of Gallion's supposed powers and the suggestion that he is also a dab hand at voodoo assassination. Gale is writing a book on fine china and visiting a small pottery company run by brothers Richard and Allen Marling, both old friends of hers, when a body turns up in their slip tank. One-Ten assigns Steed to investigate when it's revealed that Allen is developing an unbreakable ceramic, one that could have military applications and would thus be of interest to enemy agents. An amiable blend of murder mystery and industrial espionage that's not big on major surprises or surprising twists, but is busy enough to hold the interest. Familiar face Paul Eddington guests as Richard, but it's Frank Olegario's hulking hired goon Blomberg who really makes his presence felt. Does contain the priceless "My figure?" exchange between Steed and Gale that plays under the disc's main menu. Venus Smith undergoes a Vidal Sassoon makeover but is still singing in nightclubs, this time thanks to a behind-the-scenes recommendation by Steed. The owner – an old friend of Steed's – is pleased that she's brought back the customers, who all but deserted the place after the mysterious death of a magician's assistant some weeks earlier. Steed drops in to hear Venus sing, makes casual enquiries about the death, and suggest she drop in on Kathleen, an old acquaintance of hers and the daughter of invalided General Sutherland, a military official whom Steed is investigating after a leak of secret information is traced to his house. Kathleen, meanwhile, is trying unsuccessfully to convince her cynical father to see faith healer Gallam, in whom Steed takes a particular interest. A lively and well plotted episode in which Venus is once again manipulated by Steed into helping him and again sees her life threatened as a result. Steed himself masquerades as the General's masseur, in which role he gets to drop his usual cheery persona to briefly but tellingly reveal the no-nonsense operative lurking beneath. Acting on the orders of eccentric but dangerous villain Julius Redfern, burglar Leo steals two gold-plated eggs from the laboratory of Dr. Ashe, a scientist who's been quietly conducting work on deadly viruses. Leo quickly falls ill and refuses to hand over the eggs to Redfern's chief stooge Hillier until he receives medical attention. Gale pays Ashe a visit but he's reluctant to cooperate and warns her that she's out of her depth on this one. He might be right – after all, Redfern's idea of providing medical help for Leo is to send round two goons in an ambulance and then have Hillier force them off the road and kill them all. Smart direction from series regular Peter Hammond and a still topical germ warfare undercurrent give the episode some bite and as ever the dialogue intermittently sparkles: "I suppose you knew what you were doing?" asks Gale of Ashe at one point, "Biological Warfare," to which he responds, "All warfare is biological." University lecturer Richard Davies commits suicide, but whoever the hell it is that Steed actually works for suspects he was murdered and sends Steed in to nose around. Wouldn't you know it, Venus Smith has a job there as a rag week singer and in no time finds herself unwittingly involved in Steed's investigations, which start to uncover evidence of an organisation that is blackmailing students to secure their post-graduate obedience. By this point it's clear that Steed regards Venus as less than his equal and someone he's happy to manipulate and even place in mortal danger to serve his purpose, which is starkly reversed in his alarmed reaction to the discovery that the gang have sent her a face cream laced with acid. A busy and smartly plotted episode with very nice character moments and a most enjoyable turn by John Standing as Ted East, a student who doesn't buy the suicide story and is conducting his own investigation into the death. As usual, the plot pauses a couple of times to listen to Venus sing, but there's an accidental highpoint when Julie Stevens fumbles her dialogue and Macnee improvises cheerfully around it. Noted astronomer Dr. Richter is murdered while observing the path of a supernova fragment that, if his predictions are correct, will crash into the sun and destroy the earth in the process. Cathy knows more about supernovas than Steed, of course, so it's she that goes undercover at Richter's place of work, and she's not been there long before a second member of the team is offed while sitting at the very same telescope of death. Also taking an interest in Richter's predictions is money-hungry speculator Maxwell Barker (familiar face George A. Cooper) and American money bucket Mervin Johnson (Bill Nagy), who have their own unscrupulous reasons for keeping tabs on the team's progress. A well developed and potentially apocalyptic storyline with its share of socio-political asides, not least in the discussions about when to release the information to the public and the preparations being made to control the anticipated resultant anarchy, and I can't help thinking that episode writer Malcolm Hulke held the likes of Maxwell Barker in particularly low regard. Good for him. Circus clown Carlo Benetti is visited by an Italian named Sica, who reminds him of past obligations and orders him to kill Steed. He tries, but he's nervous and fails and so goes into hiding. Cathy joins the circus as a magazine reporter, where she is bunked in with Carlo's wife Rickie and befriended by The Professor, a middle-aged dwarf with a knowledge of all things circus. While she investigates Carlo's disappearance, Steed discovers a connection to a crime organisation known as the Mafia. A smartly directed episode (a tracking shot that stays locked on Rickie's face as she walks is excellent) with a couple of lovely exchanges. Steed remains impossibly upbeat even when his life is threatened and Blackman really shows her acting metal in her last act emotion at Steed's near-demise. A Greek diver named Stephanopoulus dies under mysterious circumstances on a cruise ship owned by the wealthy Mason, who is financing on-board experiments involving a pressurised diving bell. Also aboard is Venus Smith, who knows next to nothing about any of this until a stowed-away Steed appears in her cabin and clues her in. Steed quickly makes contact with Stephanopoulus's colleagues, a small group of divers and group of part-time spies known as The Frogs, who are looking to take revenge on whoever was responsible for their friend's death. For my money the best of the Venus Smith episodes, not least for a colourful collection of characters that include no-nonsense Chinese agent Anna (Yvonne Shima) and perpetually cheerful Greek diver and ladies' man Ariston (enjoyably played by John Carson in the manner of a young Anthony Quinn). The snappy spontaneity of the live TV format is very well showcased here, particularly in a late-episode appearance of diver Emma in an immaculately timed physical punctuation mark to Steed's announcement of her imminent arrival. Prominent shipbuilder Herbert Collier dies in a car crash, but we've already been clued in to the probablity that this was no accident. It soon becomes clear that three other industrialists with whom he collaborated were to blame, the action taken to prevent him signing a deal that they are opposed to. But when Collier's son Brian inherits the firm and sticks with his father's position, he also becomes a target for violent removal. Complicating matters is that Brian is romantically involved with Rosalind Waldner, the daughter of the group's unofficial leader Oliver Waldner and the man indirectly responsible for Herbert Collier's death. But there's more. Oliver likes to throw social gatherings, and attending this weekend's one is none other than Cathy Gale, who it turns out went to school with Rosalind and since she arrived has started to become romantically involved with her father. It may sound a little convoluted but it plays out clearly on screen, though there's still plenty to keep us guessing in the uncertain loyalties and intentions of stony executive Julian Seabrook, another splendidly icy turn by The Decapod's Philip Madoc. Blackman once again shines in her end-of-episode suppressed emotion. Steed is investigating dodgy dealings a boxing club run by Sam 'Pancho' Driver (the inimitable Patrick McGee) and leaps at the chance to sponsor the boxing career of young Joey, Cathy Gale's latest youth project. But just what is the connection between the boxing club and fashionable clothing designer and perfumer Fernand? One of the more straightforward plots of the series is made a little less so by the substance in which our Pancho is dealing. I'm saying no more. As outlined above, The Avengers was shot live and recorded to monochrome video tape and then transferred to 16mm film for archiving. And remember we're talking 1962 here, only 11 years after video tape as a recording method was first demonstrated, and a show that was designed for transmission on a VHF 405–line TV system, and if you've seen TV material from that period before then you'll probably have a good idea of how rough it can look. But the picture here is far better than this might lead you to expect. Yes, the resolution is a long way from the crisp TV transmissions of today, but the contrast is strong without feeling overly harsh, the detail impressive in places – the patterning on clothing, the detail on facial close-ups – and the picture stability at its best is rock solid. There are flaws, all detailed in paragraph six of this review above and inflicted by a combination of the technology of the time and the passing of the years, but for the most part this is a most pleasant surprise and a testament to the efforts of those responsible for the restoration. The mono soundtrack is largely as you'd expect, clear enough but with a very narrow dynamic range.. What surprises is how clean the track is for much of the time, with little in the way of damage, with background his an only intermittent visitor and rarely that obtrusive. Jaz Wiseman plays host for producer Leonard White, who talks about his involvement with Police Surgeon and how the desire to create another series for its star Ian Hendry led to The Avengers. He talks a little about the process of shooting live and admits to missing the uniqueness of the process and wishes more of the first series had survived, particularly as he regards Hot Snow as the first half of a two-parter that was completed with the now lost Brought to Book. Four caption cards (one from Police Surgeon and three from The Avengers) from a time when they had to be shot with a rostrum camera rather than created on Photoshop and dropped into the timeline. A useful outline of how Police Surgeon was conceived and developed and how it led to The Avengers, built around interviews with series creator and writer Julian Bond and producer Leonard White. The very first episode of the short-lived series that eventually gave birth to The Avengers. 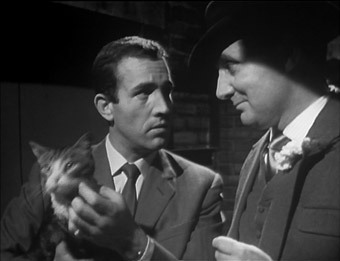 Ian Hendry stars as Dr. Geoffrey Brent, the medical man of the title, and in the first episode comes across as the voice of liberal reason at a station where the duty officer dismisses Brent's pleas on behalf of a young arrestee with the offhand, "What am I supposed to do, play probation officer?" The bulk of the show consists of a well scripted café chat between Brent and a wayward youth played by a young Michael Crawford, which makes good use of the television studio format. It was written by Julian Bond and directed by John Knight. 17 brief stills galleries of varying length catalogued by episode. PDF documents of the camera script for A Change of Bait, scripts for Brought to Book, Hot Snow and The Frighteners, a Woman's Mirror article tiled Knit With The Avengers, a TV Crimebusters comic book, and TV Times covers featuring Police Surgeon and The Avengers. Rolling stills galleries for the four episodes on this disc, including behind-the-scenes shots, some of which are in colour. Three are over 7 minutes long apiece, but there's only one picture in The Sell-Out and it's there for just 5 seconds. PDF documents of scripts from all four episodes on the disc and the music cue sheet for Dead on Course. Episode writer Woodhouse recalls how he came to write for the series and his experiences on it, particularly his role in bringing a scientific element to the stories, which played a key part in the development of the later science fiction and fantasy-based episodes. Good scripts, he reminds us, attract good actors, and credits Patrick Macnee's openness to the concept of a strong female lead for getting Cathy Gale off the ground. He also provides the most enjoyable variant on how the character of Cathy Gale was created, a pub meeting in which the programme makers speculated on middle class male viewer fantasies, the top suggestion being that they'd enjoy being dominated by a woman dressed in leather. Hosted again by Jaz Wiseman, who sounds here as if he's reading out questions that have just been handed to him. Julie Stevens provides a brief but cheerful introduction to the episode and a couple of recollections from the filming. Rolling stills galleries for Propellant 23, Mr. Teddy Bear and Bullseye. The last two run for over 6 minutes each. PDFs of scripts for all four episodes. Another upbeat introduction from Stevens, who recalls the sequence where she has to sing and play the piano at gunpoint. 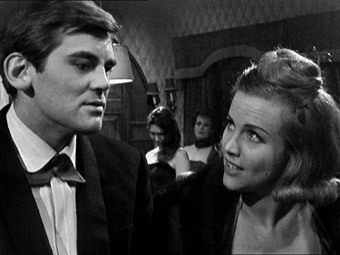 Jaz Wiseman hosts his second commentary track with Leonard White, this time for a full episode, which allows the series producer to go into more detail on a number of aspects of the show, including how the series came about, the casting of Honor Blackman (this is covered at some length), the process of shooting live and in the studio, the strength of the supporting casts, and a whole lot more. White proves a fascinating commentator and clearly has a particular affection for the early series, describing the live recorded shows as more spontaneous than the later programmes. Jaz Wiseman again hosts, and although rarely screen specific, this is a busy and informative chat with episode co-writer Roger Marshall, who breaks rank a little by describing the first series as "nonsense" and having no style, even suggesting that some of it was "unspeakable" and that he co-wrote expecting to share the blame rather than the credit. Asked what he thought of director Peter Hammond's visual interpretation of his script, however, he describes it as "stunning" and that from then on he wanted Hammond to direct everything he wrote. Rolling stills galleries ranging from 7:30 to 8:10 for all four episodes on this disc. PDF scripts for all four of this disc's episode. Rolling stills galleries from all four episodes on the disc, ranging in length from 50 seconds to almost 7 minutes. PDF scripts for all four episodes on the disc. Stevens outlines the image change her character undergoes in this episode. Rolling stills galleries for Box of Tricks, The Golden Eggs and School for Traitors ranging for 3 minutes 45 seconds to 6 minutes 40. Henry Holland gets to moderate this one and does a fine job feeding the enthusiastically talkative Stevens, who covers all aspects of her role of Venus Smith, including landing the job, her character's relationship with Steed, and her initial nervousness and awe at working with Macnee, who apparently liked doing her episodes as it gave him the chance to save the girl instead of being saved by her. Like other contributors here, she misses the spontaneity and character scenes of live TV, both of which were lost in the switch to film. She also admits that by the time they reached this episode she knew her character was on the way out. The musical numbers are inevitably discussed in some detail (one is even sung along with), and Stevens reveals that there was a song written for and about Venus that never saw the light of day – she sings a few lines and then complains "I can't thing that!" Still galleries for the four episodes on this disc, running times from 20 seconds to nearly 7 minutes. PDF scripts for all four episodes here. The still wonderful Blackman looks back at her time as Cathy Gale, working with Macnee and director Peter Hammond, and at the success of the series. She also provides her own version of how her character came to be dressed in leather. The interview is punctuated by voiceover, production photos and episode clips. An extract from the series Collector's Lot in which Blackman interviews probably the most avid collector of Avengers memorabilia, who was probably in fan boy heaven throughout. A final collection of stills from the last two episodes of the series. Includes a couple of shots that look like the camera's gone off as it's being dropped. PDF scripts of the two episodes on the disc. Leonard White reads part of a letter he received from Patrick Macnee that cites the early days of the show and his work with Honor Blackman as the time he was happiest with the show – his views on what happened later are actually bleeped at one point, but you'll have no trouble working out what was said. This hidden extra can be accessed from the main menu by moving the cursor to the special features button and pressing 'up' on your remote. A crucial and rather wonderful piece of television history, part of which has been destroyed by the hands of fate, the rest of which have has been handsomely treated here in this excellent box set from Optimum. Fine transfers and some first class extras, and there's a real sense that those responsible have done their very best to deliver the definitive series 1 & 2 set here, evident in PDF material that includes TV Times covers and music cue sheets, the commentaries and episode introductions, the episode of Police Surgeon, and the extract from Collector's Lot. Best of all are the programmes themselves, which in their scripts, direction and performances outclass anything currently being produced on British television. Highly recommended.